Confession time: How many people, after seeing or reading the Harry Potter series, dreamed of zipping around a Quidditch field on a broomstick? How many people have longed to catch the game-winning snitch to the roars of an ecstatic crowd? I’m willing to bet a nice, frosty glass of butterbeer that I’m not the only one. Although most of the magic of Quidditch (a sport played on broomstick in the wildly popular Harry Potter series) must remain in our imaginations, an adaptation of the game has moved out of the fantasy world and into our own backyard. That’s right, Minnesota is home to three official Quidditch teams registered with United States Quidditch Association (USQ). And for people like Luke Zak from the TC Frost team, Quidditch provides a unique opportunity to play contact sports in a welcoming and inclusive environment. 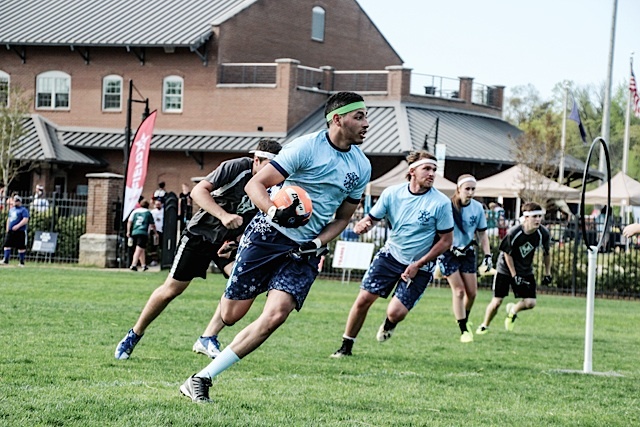 Zak describes Quidditch as “a full-contact, mixed-gender sport” that combines elements of dodgeball, football, and rugby into a game of strategy and agility. Each team contains three Chasers who attempt to score points by getting the “quaffle” ball through hoops guarded by a Keeper. Two Beaters throw “bludgers” to disrupt other players (like dodgeball). And one Seeker attempts to capture a human “Snitch” that sprints around the field attempting to avoid capture. All of this rigorous play is done with each player holding a broom between their legs. Though the broomsticks don’t provide any magical advantage, they do create more of a physical challenge that people have to learn to work around. The Quidditch teams in the Harry Potter series are made up of the best players regardless of gender, and this is the reigning policy for USQ leagues as well. The USQ notes, “When all genders are able to compete equally on the pitch, they will learn to respect and value each other’s abilities regardless of gender identity.” Additionally, the policy also pushes against traditional notions of the binary gender system by respecting and acknowledging trans individuals and people who don’t identify with the gender binary. This commitment to gender inclusivity is written into the rules through the “four maximum rule,” which strives to make sure all genders are represented on the field. Zak explains, “At any time on the field, you’re going to have six players out there. No more than four players that identify as the same gender are allowed to play at one time.” The mandatory rule recognizes gender as the players identify, allowing each member to feel safe and validated on the team. Due to the inclusive nature of the sport, Zak believes that many GLBT people like himself are drawn to Quidditch: “GLBT athletes aren’t always out or open in sports, but there’s definitely a different community within the Quidditch league that provides safe spaces for people to play.” This safe space may even give some athletes their first safe opportunity to be involved in a sport, due either to discrimination based on gender identity or sexuality. Zak stresses that Quidditch allows people to focus more on the sport than any other peripheral issue: if you can play the game, you’re allowed to play, no matter who you are. As Captain of TC Frost, Zak finds Quidditch to be “an incredible outlet to push myself physically and mentally.” Preparing for a Quidditch game is a large time commitment. 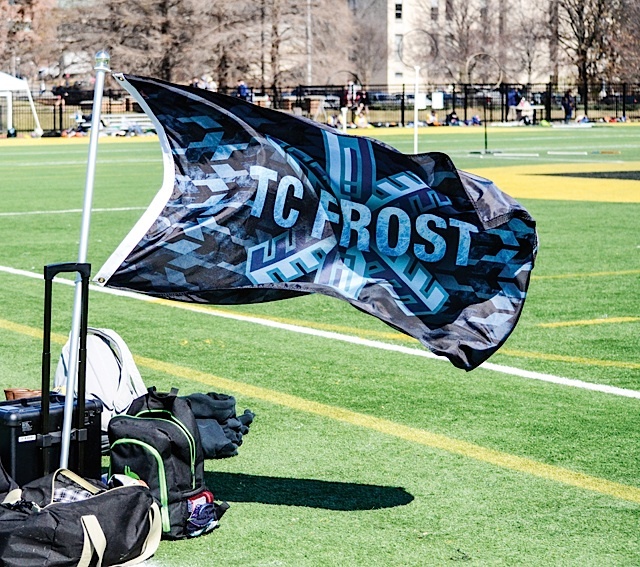 During the tournament season, TC Frost practices three times per week. In the practices, players run drills to increase agility, perform physicality exercises to step up against aggressive teams, and discuss gameplay strategies. 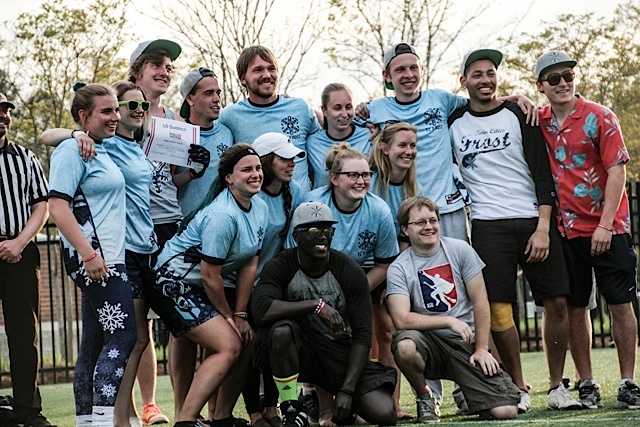 Since TC Frost is an adult community team, they occasionally hold open summer practices and pick-up Quidditch games so more people can join in on the fun. In the fall, the team will select their competitive traveling roster. To get involved with TC Frost, check them out on Facebook (www.facebook.com/tcfrostquidditch) or on Twitter @TC_Frost. Be sure to check out the USQ league at www.usquidditch.org.